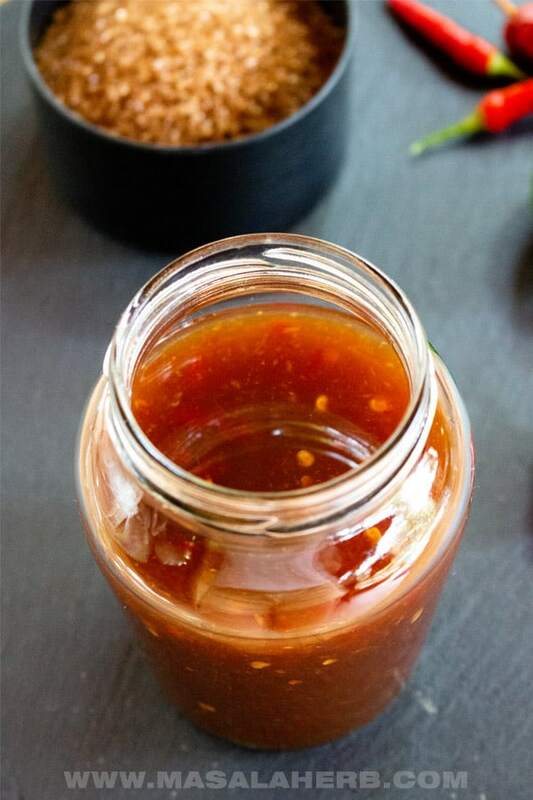 Thai Sweet Chili Sauce Recipe is an addictive and versatile dip and stir-fry sauce. You are going to love the DIY Sweet Chili Sauce for the flavor depths and adjustments you can make so that you can prepare this chili sauce easily just the way you like it! I will show you how to make a sweet chili sauce further below with my tips and a quick video. Sweet Chili Sauce turned into an obsession for us when Nini from Nini’s Thai fast food in my village in Austria placed a bowl full of it into our face. She said we had to go for it with the egg rolls and we took her bubbly personality seriously and did just that. That was one of her best ideas besides having this combination of foods with a Thai beer! Sweet Chili sauce is a common sauce used in Thai and Malaysian cuisine as a dip or as an addition to stir-fries. However, sweet chili sauce can be commonly found all over the world due to its large popularity and because it’s quite versatile. Usually, you can find a sweet chili sauce bottled in your local supermarket in Europe, Australia, and the US. Popular brands such as Mae Ploy or Thai are both the biggest producers of commercially available sweet chili sauce. In places such as Thailand, Sweet Chili sauce is prepared from scratch and it’s quite easy to do that at home. Besides. the homemade DY Chili Sauce tastes so much better! To make this Thai Sweet Chili Sauce you will need a handful of common south Asian ingredients. If you have been cooking stir fries and similar then you should be having these ingredients at home. If you are one to love Thai or Malaysian food but new to these cuisines and willing to try and cook, then I suggest you get these ingredients. The fish sauce and rice vinegar are essentials and you will need them frequently. You can pick your Chilis for this sauce. To make a mild sweet chili sauce without heat, use something like red Jalapenos. Adding Jalapenos makes the sweet chili sauce thicker and fuller too in consistency. For a hot Chili sauce, you can pick Thai bird’s eye chilis and add somewhere between 2-5 Chilis. I used a combination of bird’s eye chilis and regular Indian chili. With the chilis, you can play around and try different varieties too. Using a different chili variety will result in a sweet chili sauce with various flavors. Mike & Patty from Chili Pepper Madness talk about your chili choices, you can get a picture of what to work with to make this sweet chili sauce. I tried this recipe, which by the way was influenced by Pailin’s Kitchen’s sweet chili sauce, with white sugar and brown sugar and I have to say I prefer the brown sugar version. The brown sugar gives a deeper flavor to the sauce which goes so well with the chili, ginger, garlic and even the lime juice! However, the brown sugar turns the sauce a bit darker in color. I love it that way too. The red of the sweet chili sauce is not that bright but appears more deep red. So I suggest you use brown sugar or palm sugar. Please use only Rice Vinegar because I think any other vinegar might be too overpowering for this sweet chili sauce. You want the sauce to be slightly tart sweet and more or less hot, but not reek of vinegar. Besides vinegar, I like to add lime juice to add more flavor, which is also acidic, so therefore using rice vinegar is the best idea for this sweet chili sauce so that all the flavors can co-exist in harmony. The Cornstarch can be added or not. Its purpose is to thicken the sauce. I don’t like too much cornstarch and I enjoy a thinner sauce so that I can use the sauce in stir-fries, therefore I add less cornstarch. Eventually, you could add another tablespoon of cornstarch to thicken the sauce all the more if you want to a jelly consistency. Another option is to cook down the cause longer without adding any cornstarch but it won’t get the jelly consistency. Adding cornstarch to your sweet chili sauce is a decision you can take on your own. Just make sure to mix a small quantity (you don’t need much cornstarch) in warm water so that it dissolved before you add it to the hot sauce because otherwise, the cornstarch can create lumps in your sauce. Other ingredients such as the ginger, garlic, lime juice and fish sauce add a lovely flavor to the sauce. You could skip the fish sauce but I wouldn’t suggest it. 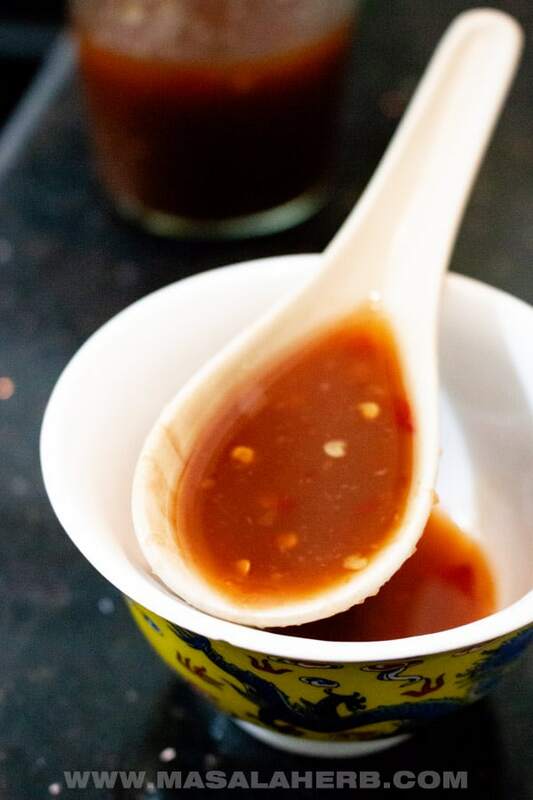 Fish sauce will turn your sweet chili sauce super special, it’s like a secret ingredient! How to make Sweet Chili Sauce? 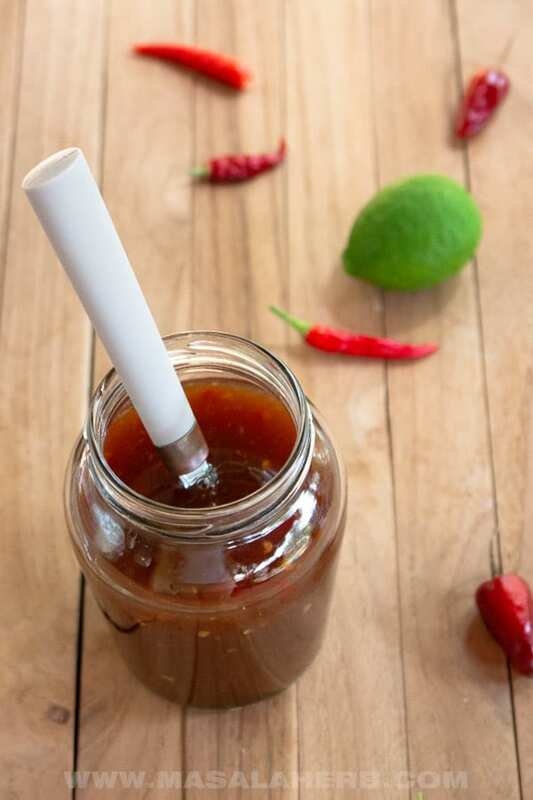 To make this sweet chili sauce from scratch you will need a blender or a mortar and pestle. Also get a small non-stick saucepan which heats evenly. That way you will be able to make this sweet chili sauce easily and so that it’s stuffed with gorgeous flavors! The chili, fresh ginger, and garlic should be blend together in a blender with water. but so that you have small chunks of the ingredients left in it. Or with the mortar and pestle smash the ginger garlic and chili small to a paste-like consistency with small bits of the ingredients and mix it with the water. Add the chili mix to a saucepan and heat up. At this point, you can add the sugar, vinegar and fish sauce. Then you just need to stir the content well while it’s getting hot and cooking. Also keep away from the pot. The heat from the chili and vinegar shouldn’t come close to your face! Prepare your cornstarch with some hot water. Make sure it’s properly dissolved and add that to your finished cooked sauce. Let it all cool down and when cold add the lime juice and stir. The lime juice will make it a bit more liquid so if you want you can add a tad more cornflour mixture first (before the sauce cools down) to the sauce if you want it thicker. Can the Thai sweet Chili sauce go bad? Usually, the Thai sweet sauce is refrigerated and ingredients such as the vinegar and sugar make sure that the sauce doesn’t turn bad. Although we have added water to the sauce, we need to keep in mind that the sauce is boiled so microbes are killed. Just make sure to store the sweet chili sauce in a sterilized jar (as you would do with jam) and the sauce will be good for at least a few months if stored in a cool and dry place. The quantity of the recipe is smaller, and when reduced during the cooking process, makes about 240 ml or 8 oz. Usually, your sweet chili sauce will get most probably over before it can possibly turn bad. Hot Sauce Bottles are more convenient but of course, you can just use a simple jam jar as seen in my pictures. Thai Sweet Chili Sauce comes together quickly with fresh ingredients. Just make sure to follow the recipe as it is. 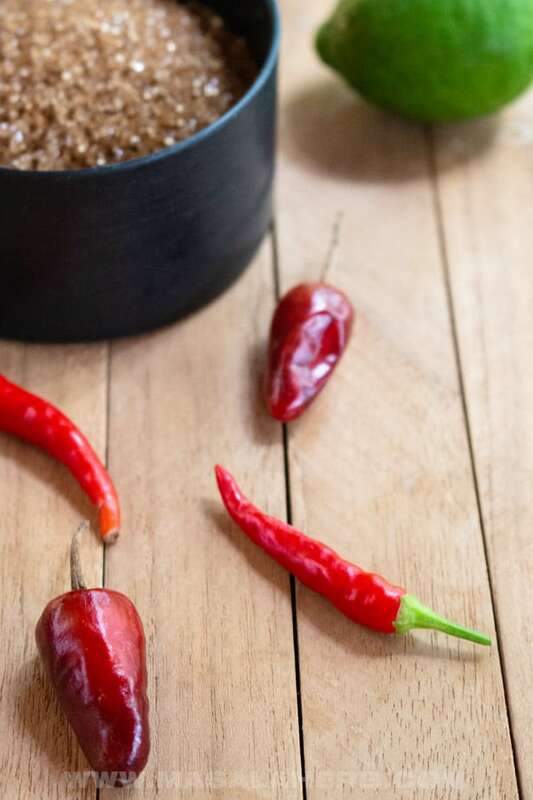 Don't reduce the sugar, after all, it's a sweet chili sauce, the sugar helps in preserving the sauce for a longer period of time and besides you are just supposed to use small quantities of this cause in your food as a stir-fry or dip. Discard the stem of the chilis and place into a mixer or mortar with pestle. Add the garlic and ginger and if you blend it, add the water as well. If you want to use the mortar with pestle then smash the ingredients first and then mix with the water. The consistency should be a bit rough, and you should have some chili pieces in it. Place a saucepan on the heat and pour the chili water mixture with the brown sugar, rice vinegar, and fish sauce. Mix the whole content well with a whisk and allow to cook. Bring to a rolling boil. When you cook the sauce keep your eyes and face away from it because the vinegar and chili are super strong. Mix the cornstarch with the water. Take the pan from the heat and mix the cornstarch mixture into the pan with the sauce. Let the sweet chili sauce cool completely and then add the lime juice and mix well again before storing the sauce in a clean sterilized sauce bottle or jar. The sauce gains in flavor and character in the jar over time. Store in a cool and dry place such as the fridge for up to a few months without a problem. Pick mild chilis such as red Jalapeno to make the chili sauce without heat. To tone down the heat, you can also remove the chili seeds. To make it hot use red Thai birds eye chili. I like to use piri piri (African bird eye) or Thai bird's eye and the common Indian Jwala chili. You can experiment with different chilis such as red poblano, jalapeno etc. Use brown sugar to add depth or palm sugar. Regular sugar will make the sauce more bright. Increase the amount of cornstarch by 1/2 or 1 tbs to make the sauce thicker or keep out the cornstarch completely if you want a very thin stir fry chili sauce. I have to confess that I even use the sweet chili sauce as a dipping sauce for non-Asian, completely unconventional foods which are at times already a but spicy such as the golden baked coconut chili drumsticks and Piri Piri chicken. Dear Reader, how are you planning to use the Thai sweet chili sauce? Please feel free to share your thoughts with us in the comment section below. Wow, this was so flavorful and addictive! Thanks so much for the recipe!! We love sweet chili sauce, on just about everything. Thanks for the great homemade recipe! 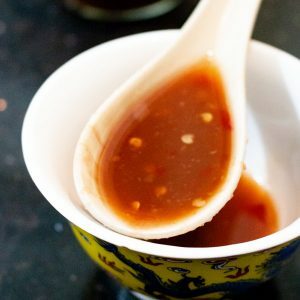 Hi, this may be interesting you: Thai Sweet Chili Sauce Recipe!